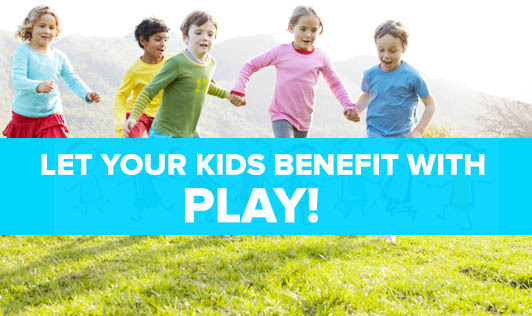 Let Your Kids Benefit With Play! Physical activity enhances fitness, fosters growth and development in children and also helps them explore and learn more about the world. Children are innately physically active, but today, we find them looking for "sedentary alternatives". Children today have less physical education, watch more television, play more sedentary games and do not have much freedom to play outside on their own. Let's blame the traffic, the lack of play grounds and the increased rates of crime! Consequently, there is enough evidence that our children are becoming overweight and obese. Obesity in children can become a major risk factor for several diseases that can adversely affect their health in the future. Regular daily activities provide greater benefits. In addition, being active, teaches kids the importance of maintaining healthy habits that will be more likely to stay with them for a life time. • Encourage walking to school if it is close by. • Get them to run or bike instead of taking them for a ride. • Ask them to walk the dog with you. • Encourage them to dance to their favorite music. • Replace TV and computer time with something more active. • Take your kids to a playground or park to play.